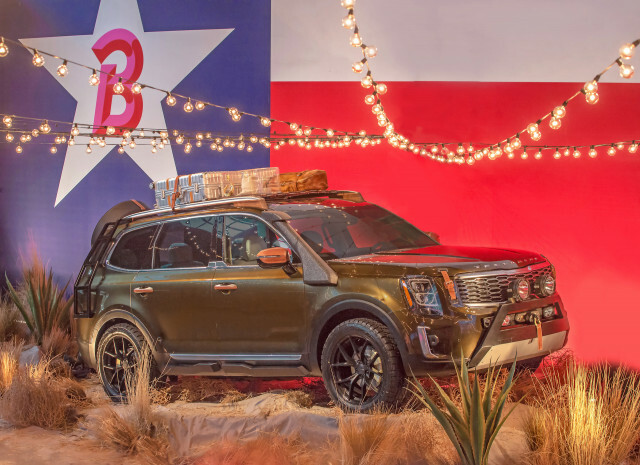 Shoppers in the market in for a spacious three-row, eight-seat SUV from a mainstream brand will soon have a new choice in the form of the 2020 Kia Telluride. The SUV was unveiled Saturday at fashion designer Brandon Maxwell’s event during New York Fashion Week and is due in showrooms in early 2019. It will be sourced from Kia’s plant in West Point, Georgia. The Telluride is the production version of Kia’s well-receivedconcept of the same nameunveiled at the 2016 Detroit auto show. It’s several inches longer and wider than Kia’s mid-size Sorento, and all the automaker is willing to say right now is that a V-6 will be offered. The version shown in New York is said to be a specially tailored design featuring several nods to Maxwell’s Texas roots, including natural wood interior trim and saddle-inspired double-stitched leather surfaces. Outside, the Telluride’s deep green paint reflects the color of the original concept, and protective elements like the skidplates and sidestep sills hint at the vehicle’s off-road potential. The Telluride is thought to be based on a new front-wheel-drive platform with transverse engine mounting and all-wheel-drive capability. The Telluride concept was based on a stretched version of the platform found in the Sorento. The concept also featured a plug-in hybrid powertrain pairing a 3.5-liter V-6 with an electric motor to generate a combined 400 horsepower, a combination we could see in the production version at some point. Sister brand Hyundai is working on a full-size SUV of its own that will likely share the bones of the Telluride. Hyundai previewed its SUV in June with theGrandmaster conceptand is currently testingprototypes in the wild. The Hyundai SUV is rumored to be called a Palisade and is expected to join the Telluride on the market next year. It wasn’t long ago that Kia had a large SUV in its lineup. The previous entry wascalled the Borrego(a Mohave in other markets) and offered for only a couple of years before finally being dropped in 2010. It had simply fallen victim to the twin effects of the global financial crisis and high gas prices.